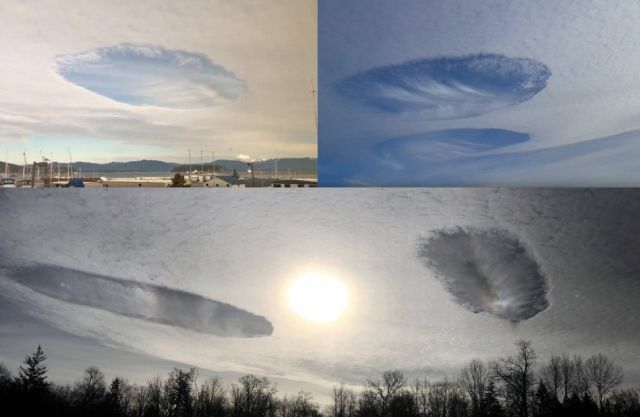 On January 28, 2019 something strange happened over Washington and Mt. Vernon. Many people witnessed what they call "fallstreak holes" in the sky. 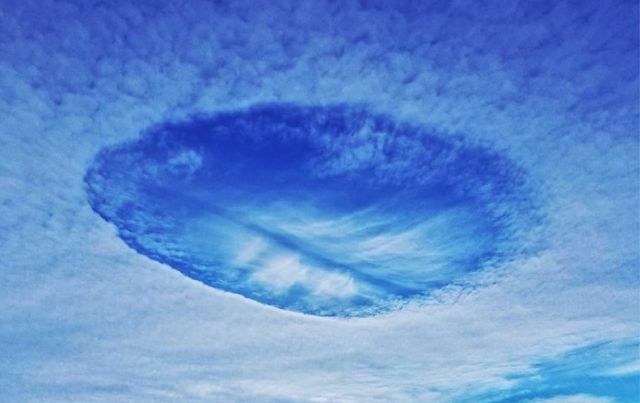 Now it is said that a "fallstreak hole" form in high altitude clouds when the temperature drops below 00 C but the water droplets in the cloud do not freeze, they remain in a super cooled liquid state. When suddenly a disturbance occurs, per perhaps a plane flies by, the sub-zero water droplets begin to crystallize in a wave expanding outwards from the point of the disturbance with as a result the ice crystals billow from the resulting "hole." So far a reasonable explanation for the strange "holes' in the clouds. But what if such a "hole" in the clouds has been caused by something else. 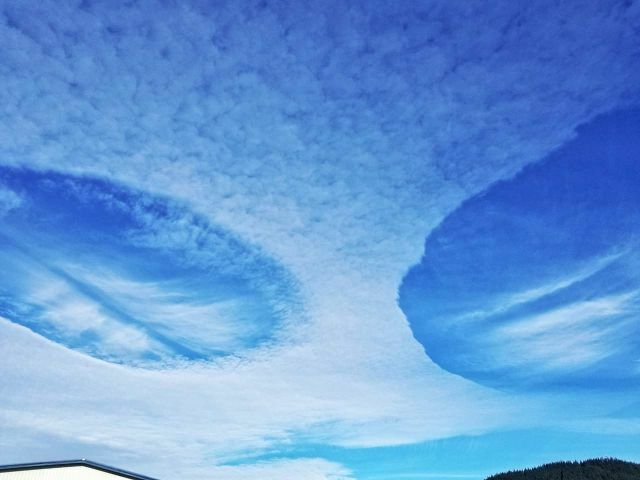 On the same day, a person has not only photographed two enormous "holes' in the sky over Mt. Vernon WA but he saw two large objects moving approx. 150 mph; then turning sharply and ascended above the clouds and the clouds dispersed. Huge "UFO" hole Mt. Vernon - January 28, 2019. I was pulled over letting my dog run and I happened to notice something moving about 1000 ft up just above me. I immediately could tell it was something I had never seen before they were both cigar-shaped metallic and traveling approximately quarter mile apart but in the same exact direction. They made a sharp kind of right and upward turn very quickly and headed straight up. It's at that point when I started to grab my phone to take a picture. There seemed to be small puffs of smoke or vapor coming out from behind as they reached almost the cloud layer then disappeared above the clouds. As I was setting my phone to camera after unlocking the phone and zooming out as far as it would zoom I looked up to aim and there were two huge holes if you will in the clouds. Huge "UFO" holes Mt. Vernon - January 28, 2019. I snapped the photos, which I have submitted to Mufon for further investigation, and literally within 2 minutes the clouds were back to normal. I heard nothing during this whole instance. I was very excited and absolutely could not believe what I had just saw right after that instant I heard too low booms kind of like a sonic boom and had to think it had something to do with the two craft I saw basically disappear in front of me. 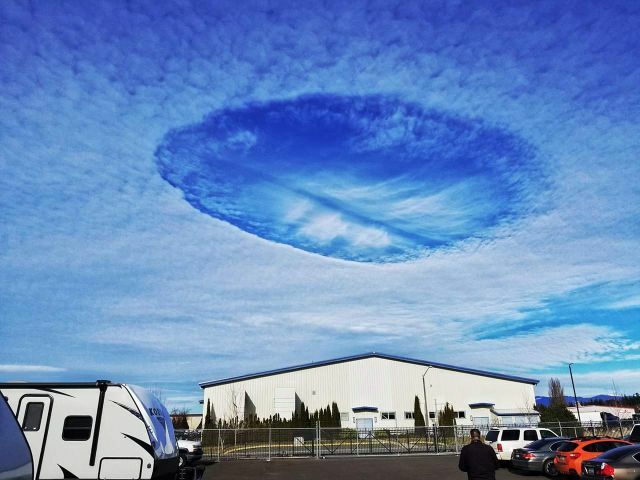 Huge "UFO" holes Washington - January 28, 2019. In summary: It appears that these "holes" are not only caused by a natural phenomenon but by cloaked or de-cloaked UFOs too. At the moment a UFO shoots up into the sky, going through the cloud layer before disappearing above the clouds, it leaves a huge hole and a boom can be heard.